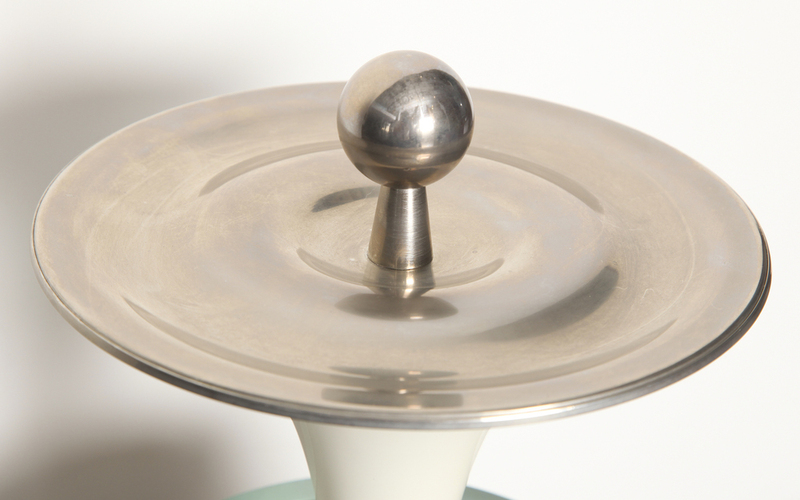 Brass structure with white painted interior. 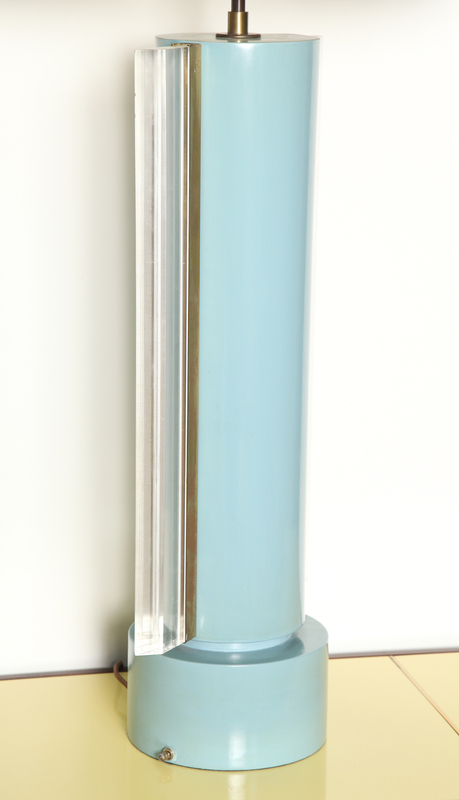 Two curved glass panels – one clear with striped etching, one colored & acid-etched. 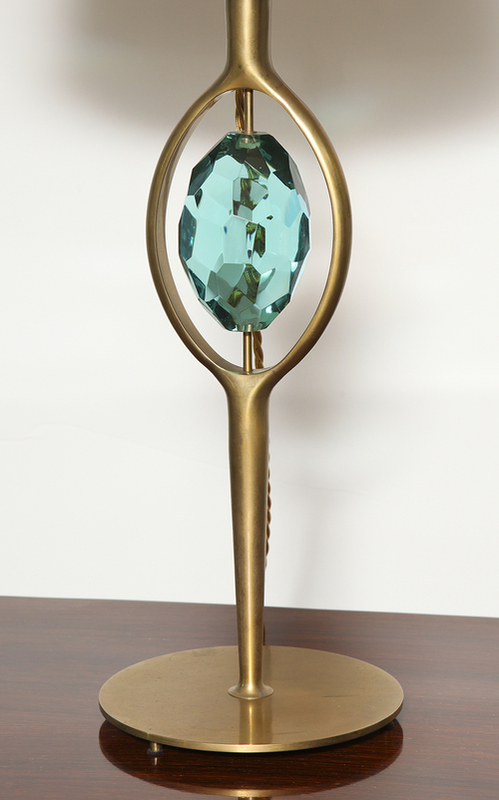 Sculptural brass structure with faceted crystal element that spins. Silk shades and wiring. 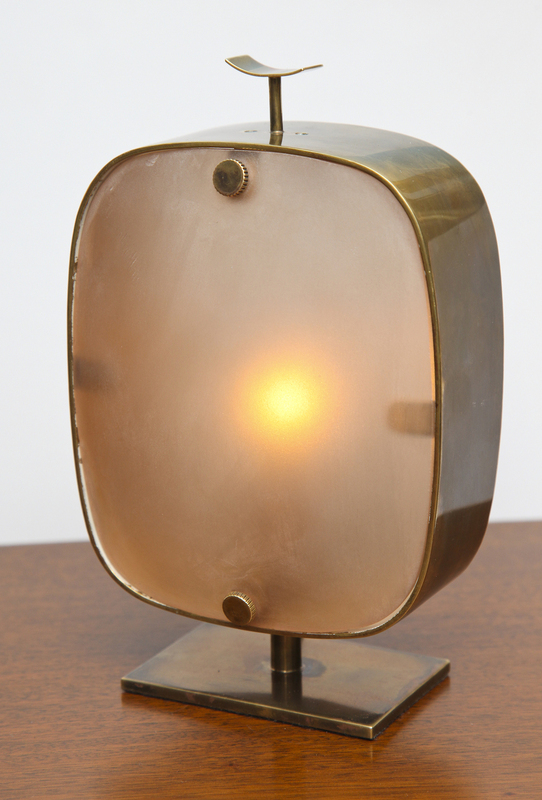 Sculptural light realized by seamlessly fusing 3 separate pieces of bronze into one. Gold patina applied by hand. Inset halogen socket that can also take an LED bulb. Edition of 8 with 4 AP's. Each piece is signed and numbered. 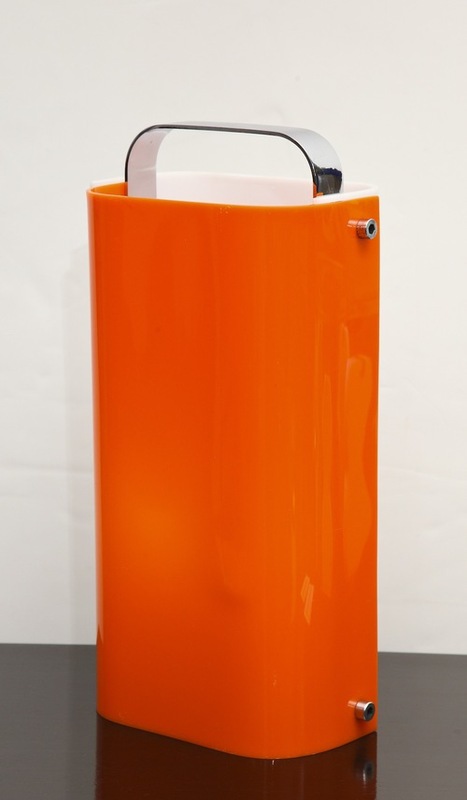 h. 27" w. 12.5" d. 5"
Large, curved perspex panels in bright orange and white. Polished chrome mounts and one edison socket. Made by and sold through Gavina. *Literature: Licitra Ponti. "Gio Ponti: The Complete Works 1923-1978." Pg. 235.
h. 15.25" w. 8.5" d. 6.5"
Excellent condition. New socket and wiring. 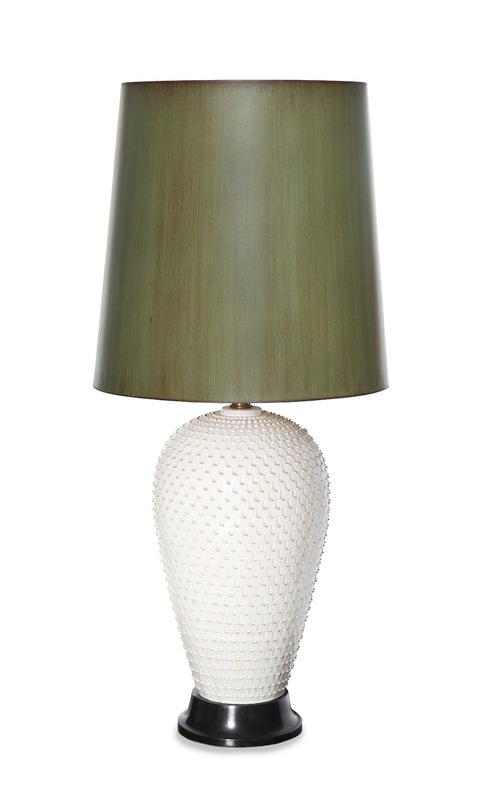 New gunmetal finish and wide articulating shade with white enamel interior. Multiples available. Excellent condition, fully restored with new wiring. 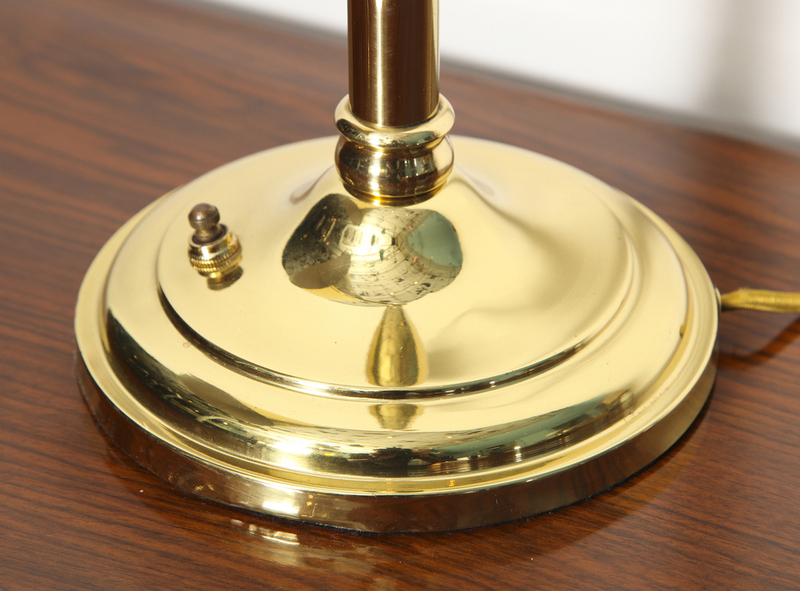 Nickeled brass ball form on footed base with crystal slab center. White painted trumpet form and ball finial. 3 low wattage bulbs inside create a beautiful ambient glow. *From an edition of two, sold individually. 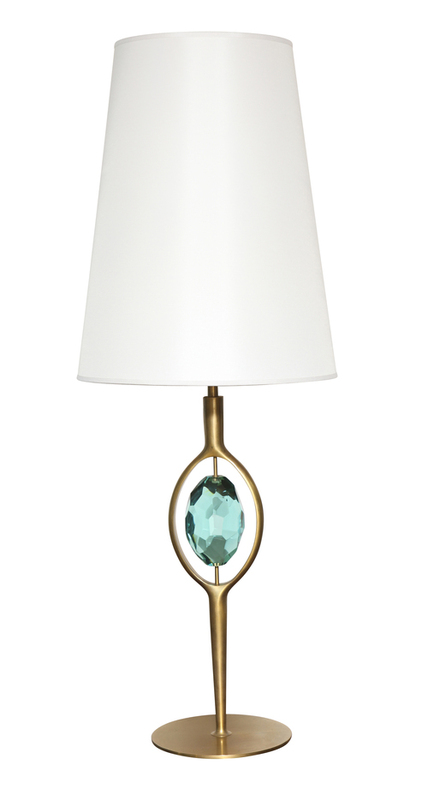 Bulbous form with interior gold inclusions and diagonal stripes of white, aqua & red. 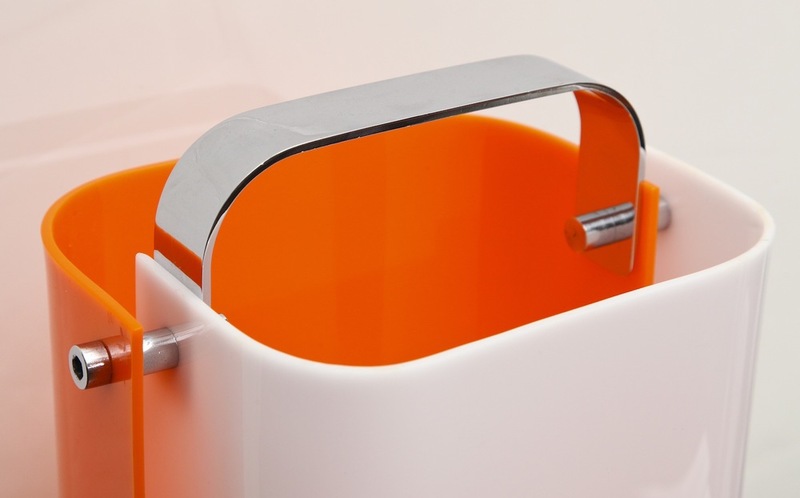 Applied handles and trim at the top and bottom. 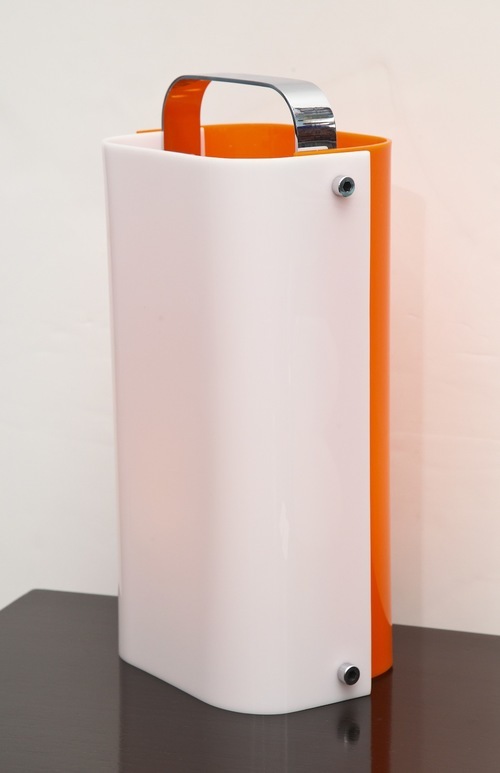 White lacquered wood pedestal base. Parchment covered wood form. 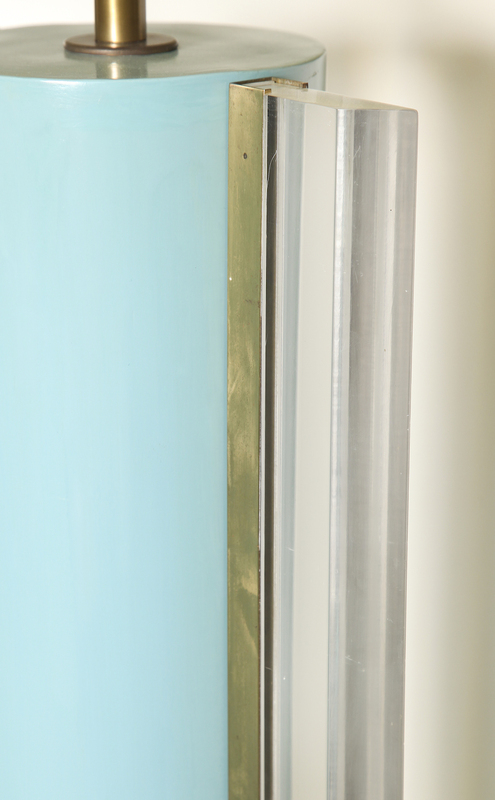 Gold-plated brass mounts and frosted laminate inset shade. A great table top figure with a low light source. Paper label on underside. 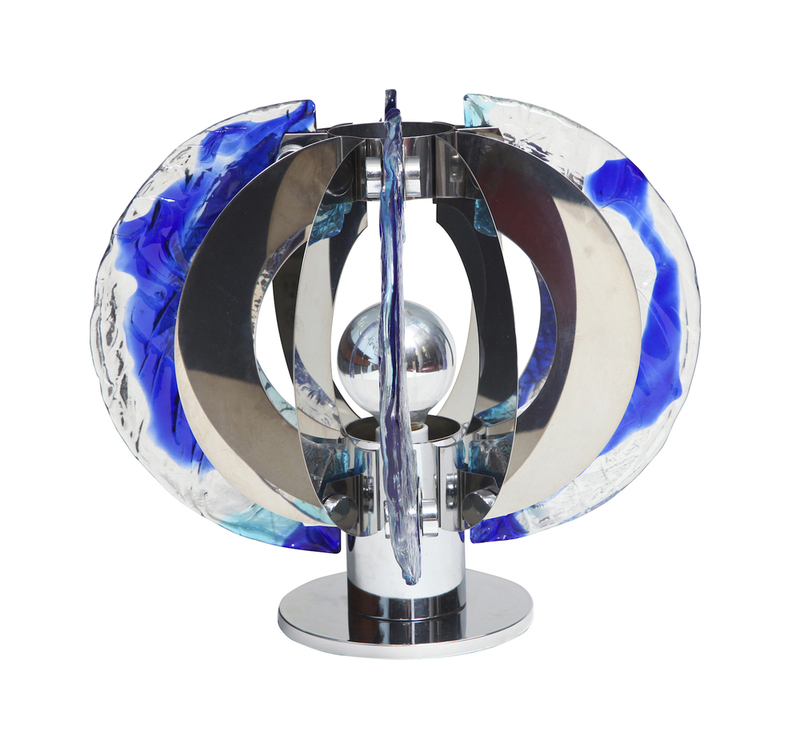 h. 21.5" w. 1.5" d. 6.5"
Turquoise lacquered wood form with beautiful lucite fins and brass mounts. 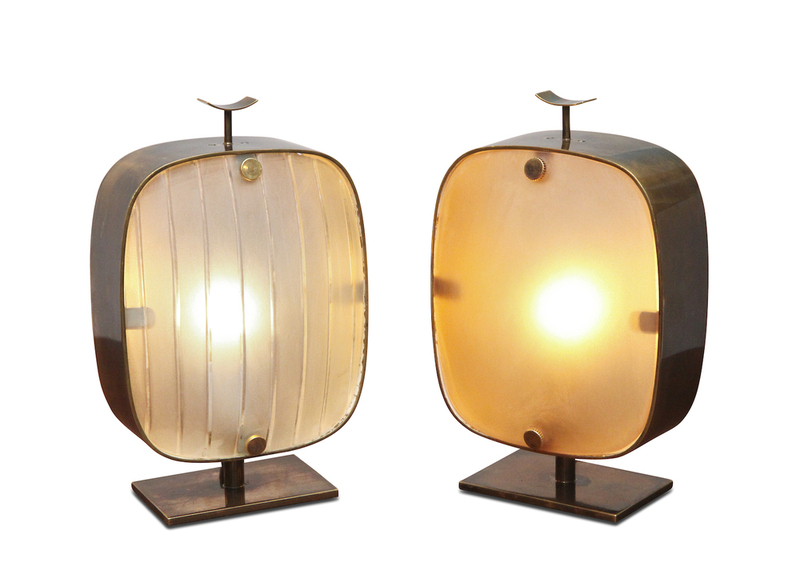 Edith Norton, based in LA, worked during the post-war period and created some very unusual lighting using lacquered wood, metals and lucite. 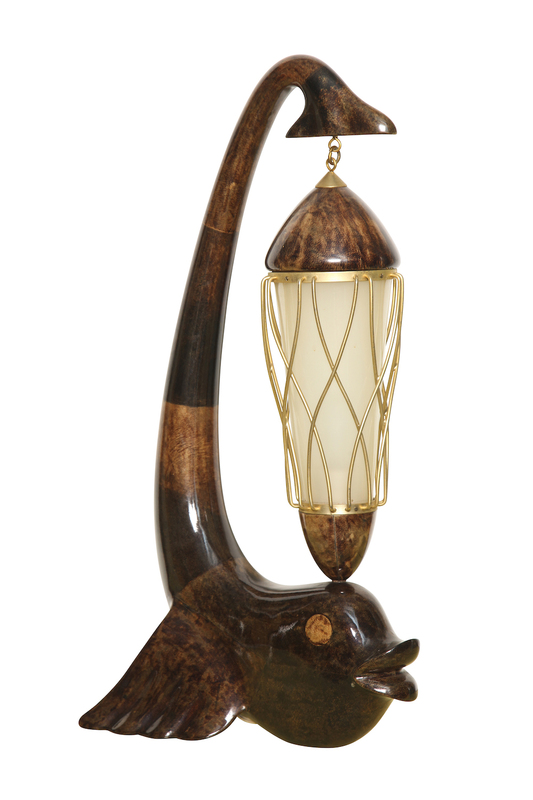 This lamp is a great example of her work, which appears infrequently on the market. Signed with designers metal label. Excellent condition, recently restored and rewired. 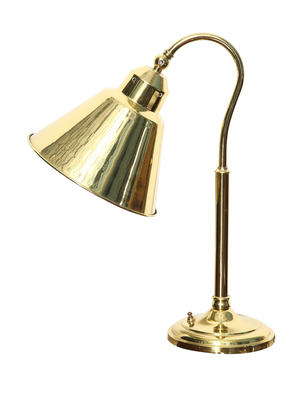 New polished brass finish and wide articulating shade with white enamel interior. Multiples available. Excellent condition. Fully restored with new wiring. 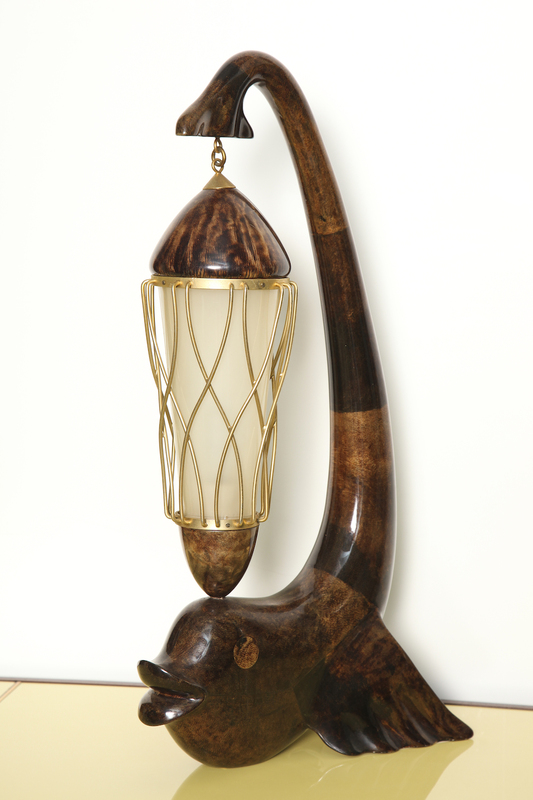 Great, large-scale lamp by Laszlo. Large Royal Copenhagen ceramic with craquelure glaze and satin nickel mounts. Recently rewired with vintage linen shade. Excellent condition with new wiring. Some wear to shade. 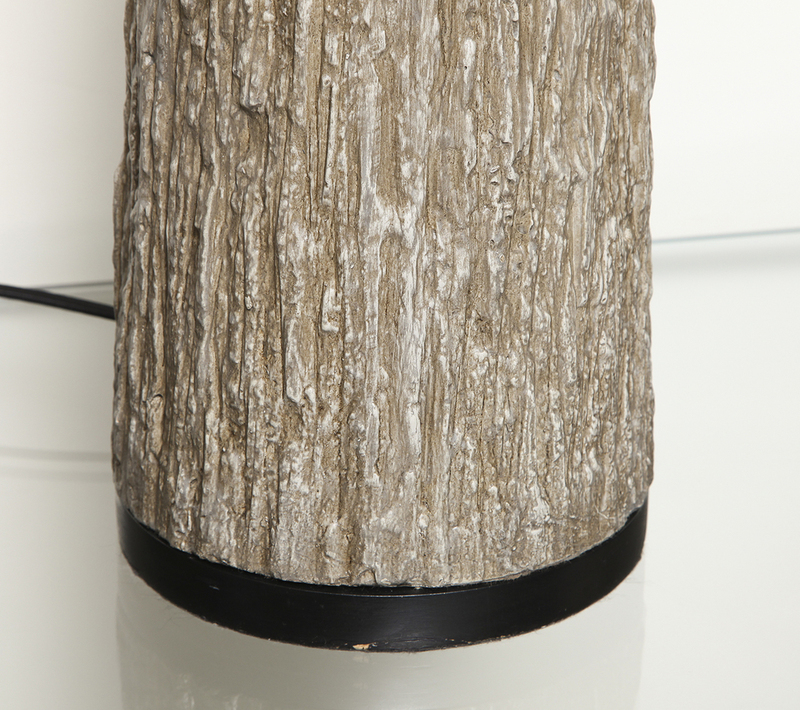 Beautifully textured, tapering form made from plaster with a circular wood base. Newly wired with three edison sockets. 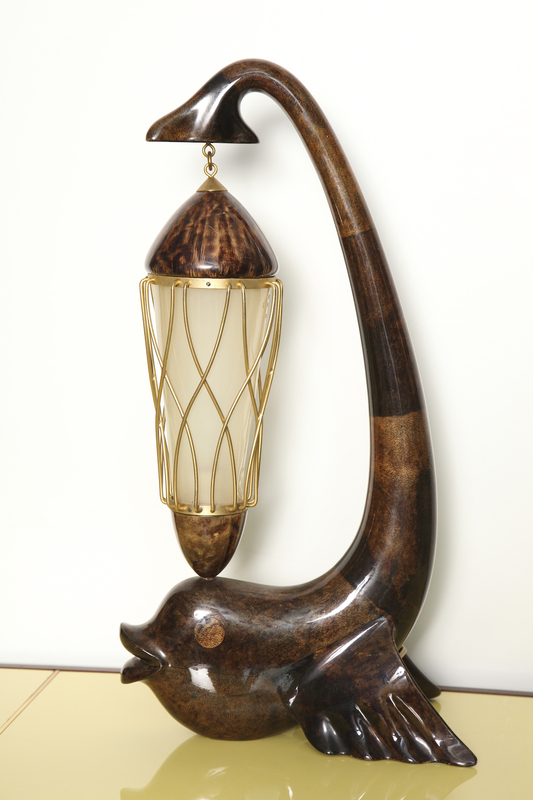 Beautiful handmade table lamp of Asian inspiration. 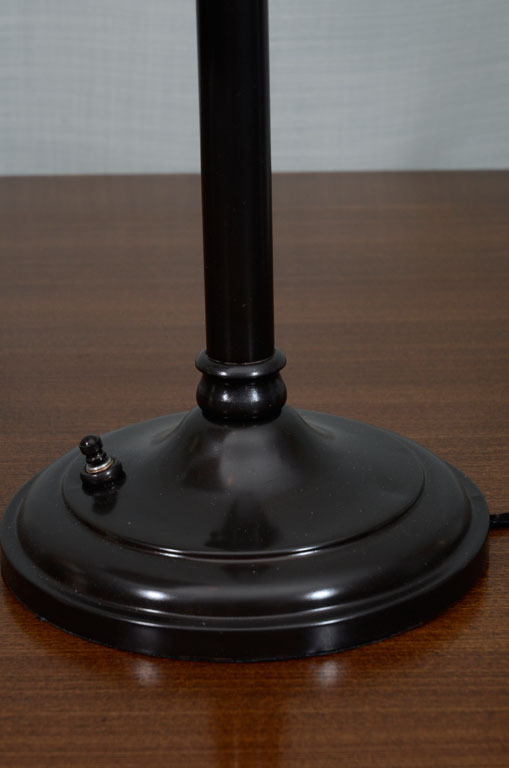 Solid wood base on three legs with lots of great detailing. 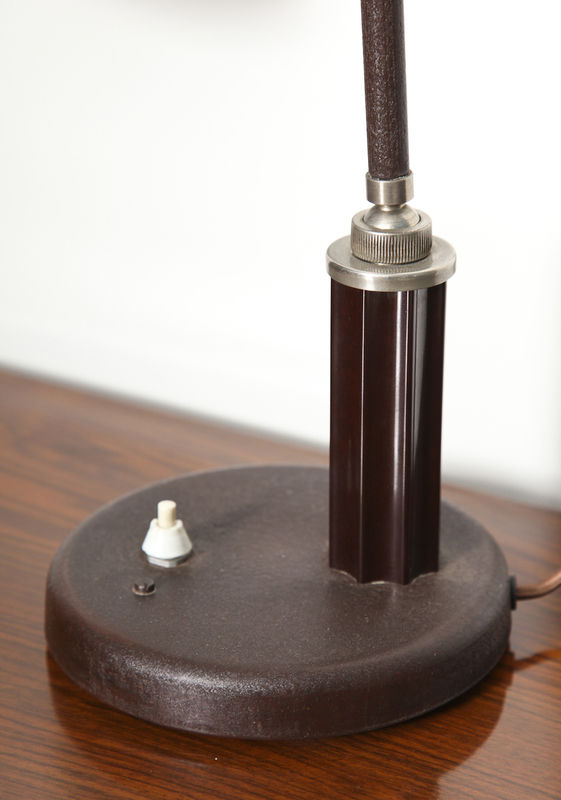 Large cylindrical shade of coated maroon paper, and new wiring. 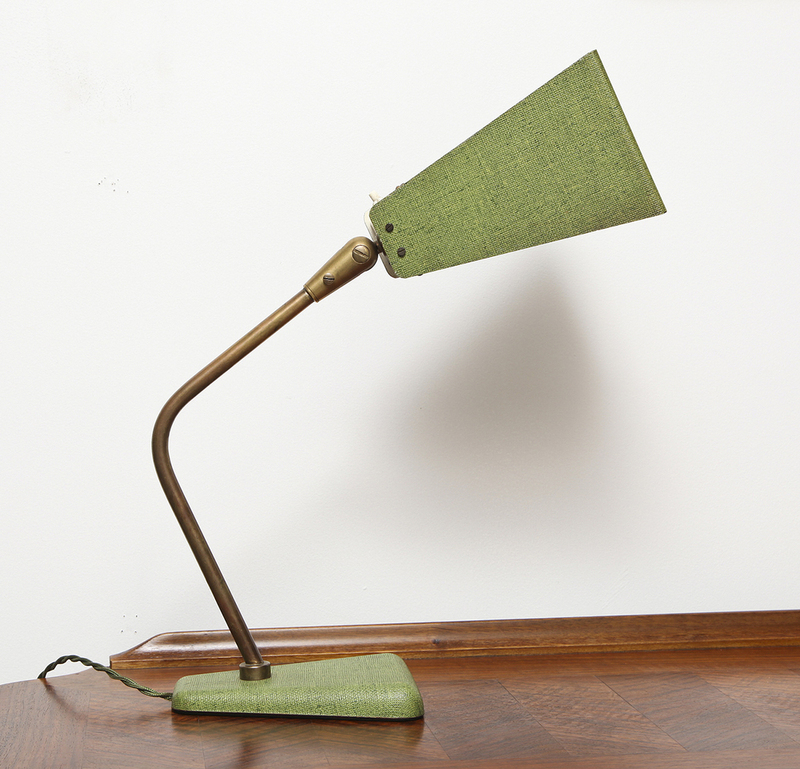 Great modernist desk lamp with green cloth laminate over metal on the shade and base. 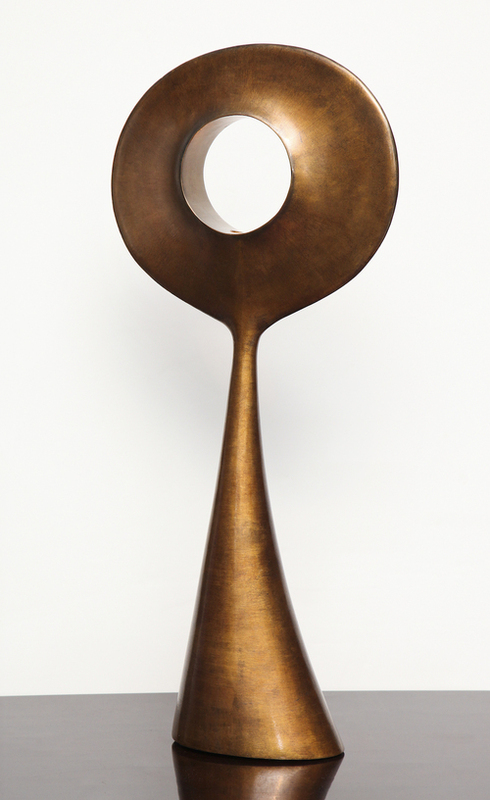 Articulated head and brass standard. 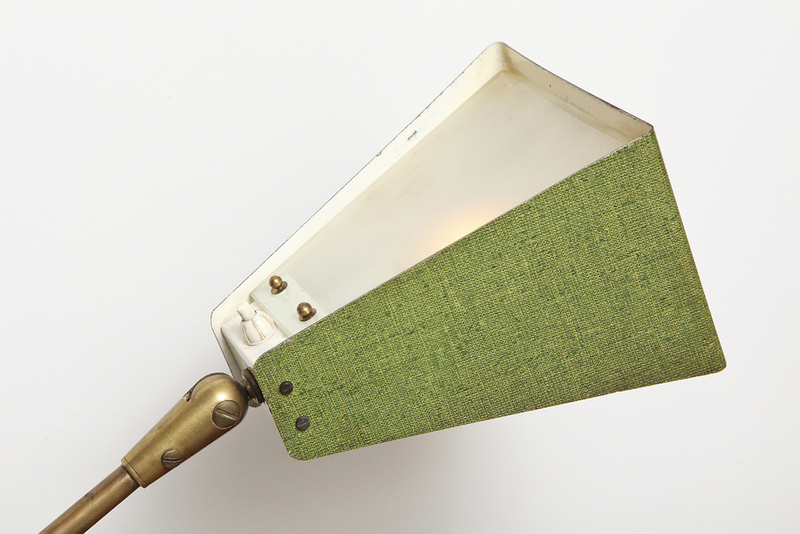 Green cloth wire and satin glass diffuser. 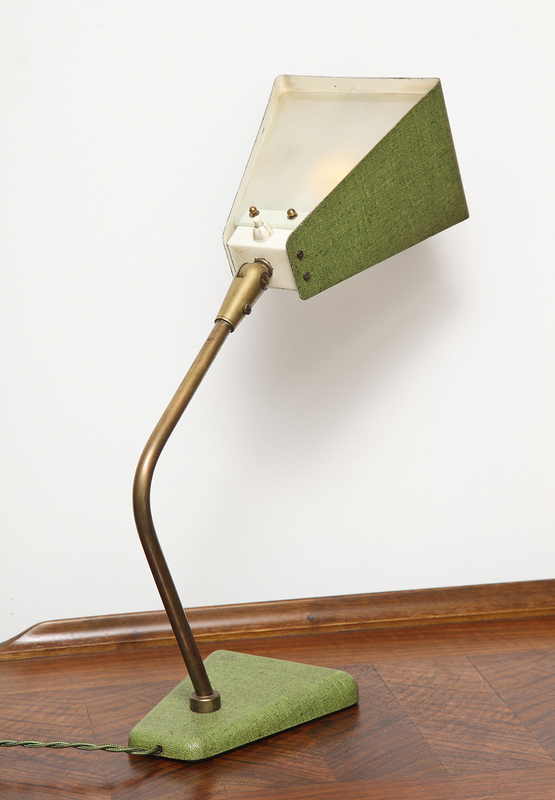 *A variation of this lamp can be found in a Stilnovo advertisement in Domus Magazine, Jan. 1963.
h. 20" w. 6" d. 16"
Excellent original condition with new wiring and plug. 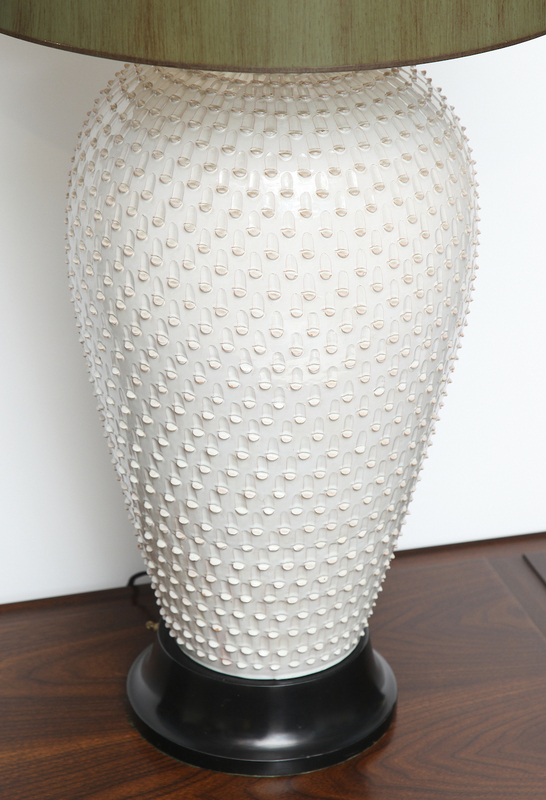 This custom made lamp features a studio-made, large stoneware base with textured relief and white glaze. 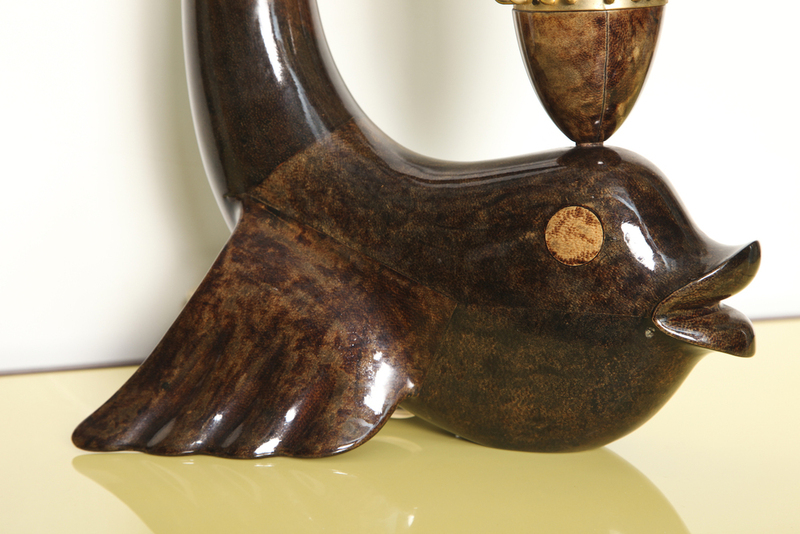 Ceramic made by Hegnetslund, Denmark. Artist signed and dated, 1955. 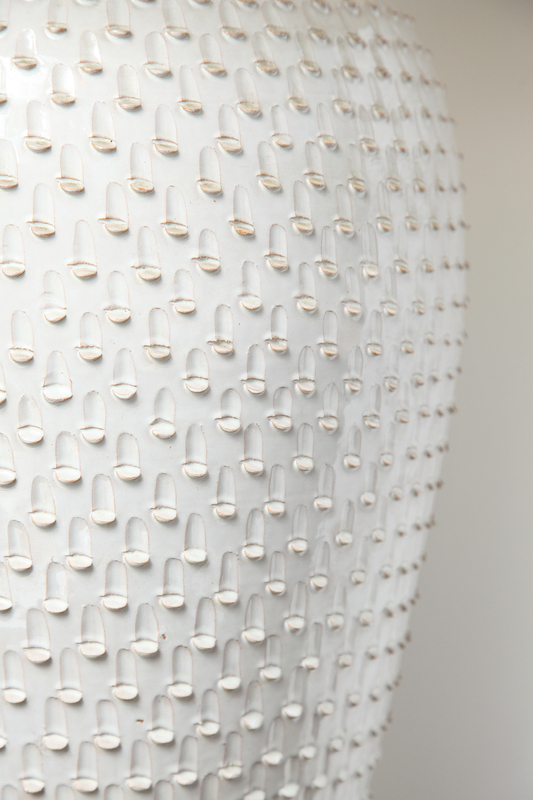 Custom mounts created specifically for this ceramic piece. Three standard, edison-sized sockets & custom hand painted paper shade. Sockets and wiring have been recently replaced. Very good condition. Some chipping to ceramic relief. 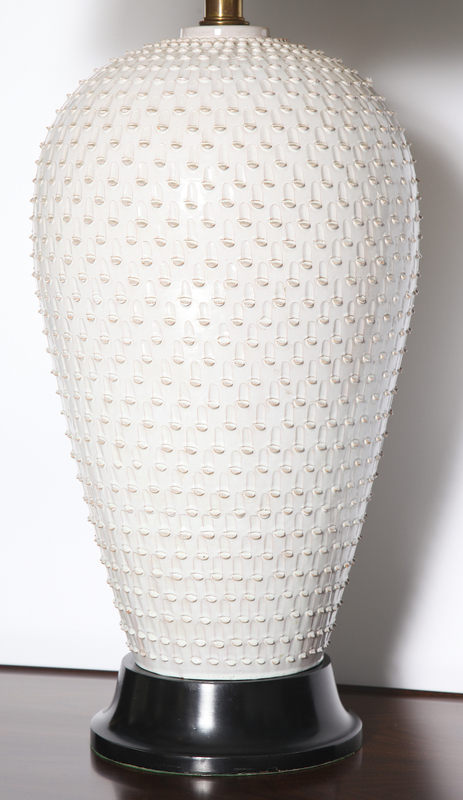 Cylindrical earthenware form with abstract relief on bulbous upper section. 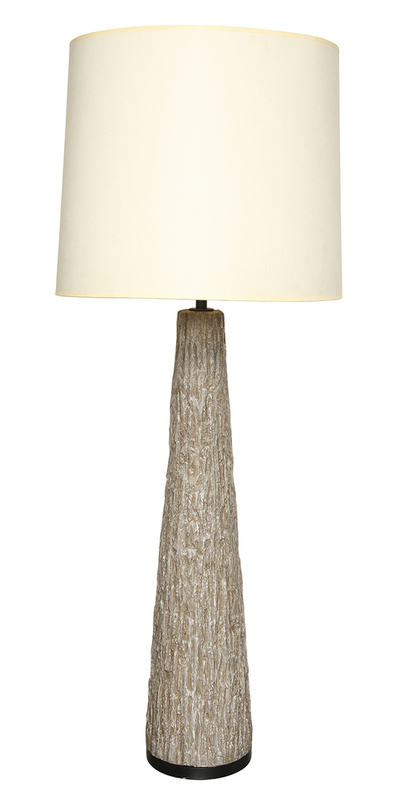 Woven burlap shade in an off-white tone. Signed. Textured panels of clear glass with bright blue streaks running through them. 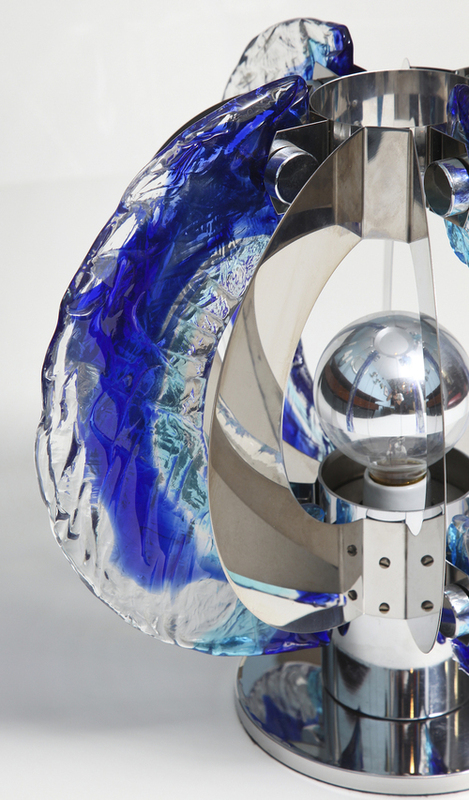 Chromed metal panels and mounts. A beautiful and rare form. Excellent original condition. Recently rewired. 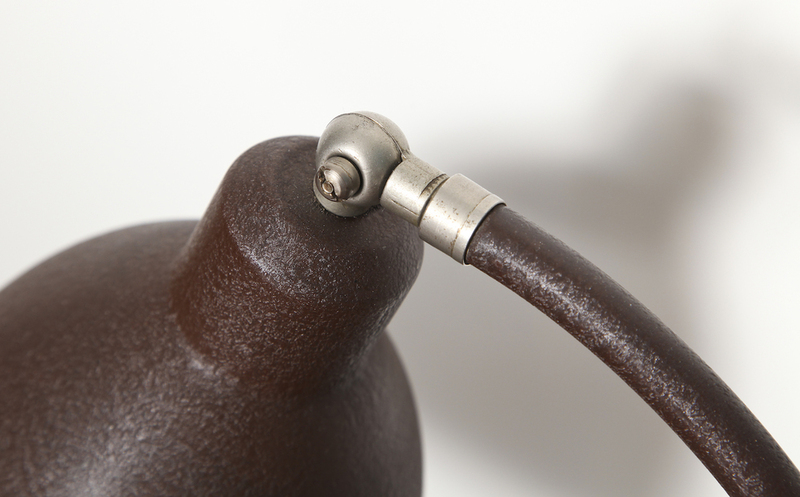 Brown painted metal with textured finish. 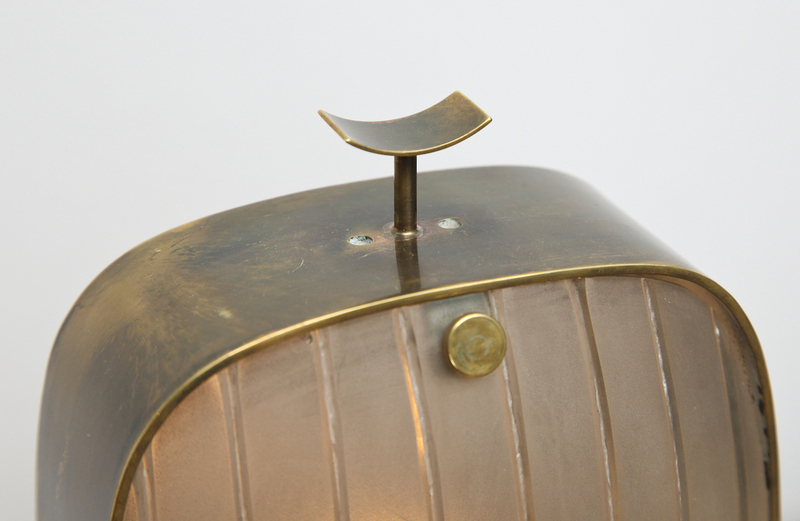 Brass mounts and Bakelite column detail. 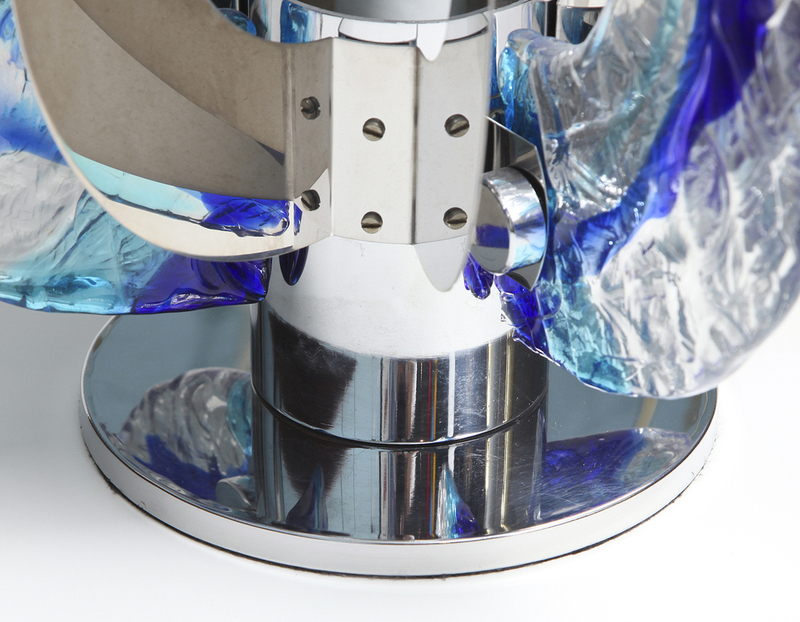 Adjustable pivoting arm and shade. 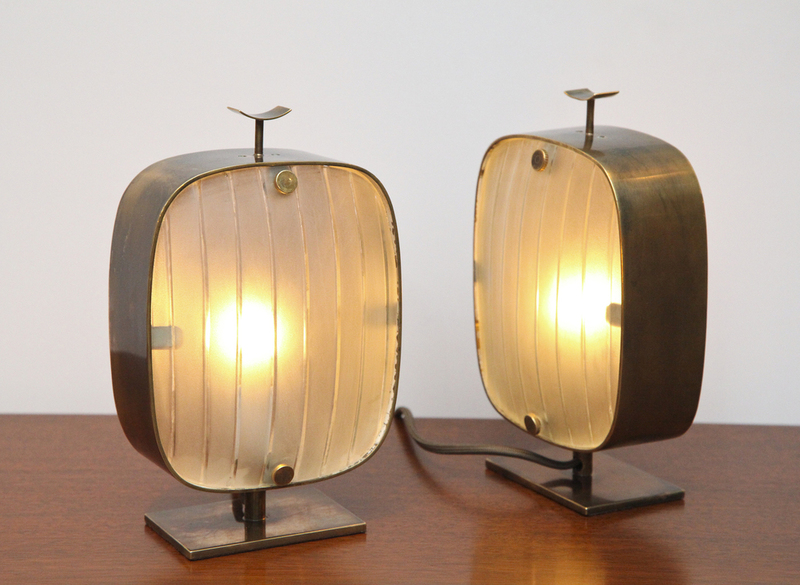 These lamps are signed and well documented. Priced and sold individually. 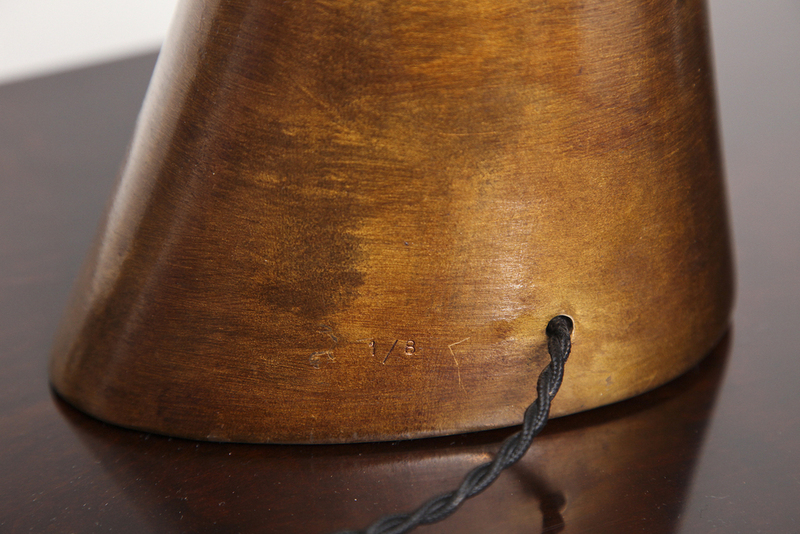 h. 16" w. 12" d. 6.25"
Excellent condition with small amounts of wear that are consistent with their age. 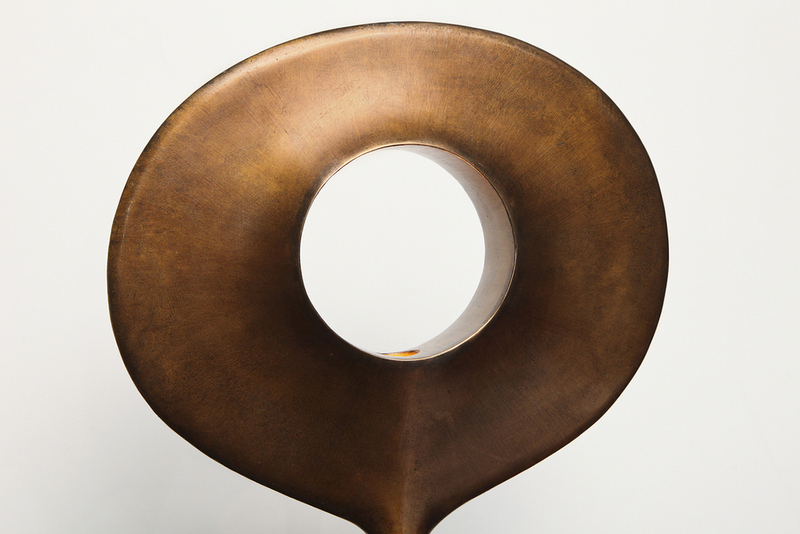 Sculptural bronze form with gunmetal patina. Elliptical plaster shade. From an edition of 20. 12 - 15 week lead-time required. 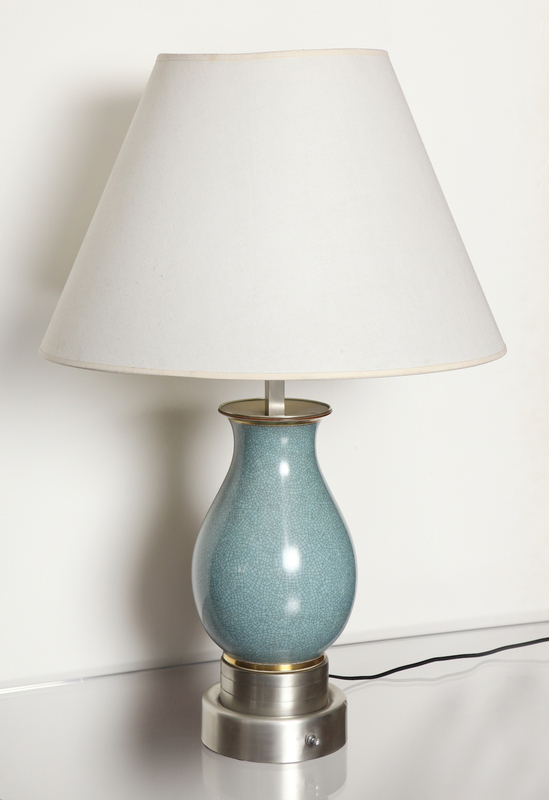 h. 20.5" w. 13" d. 5.5"
Earthenware lamp with incised, figural decoration and rough ceramic texture. Elliptical fabric shade, signed on back. h. 27" w. 18" d. 12"
Very good original condition with some wear to the shade, and new wiring.